Colin Jones is a Blackjack pro who has mastered card counting and has been beating casinos around the globe. He runs a network of card counters that have beaten casinos for millions of dollars. They created the Blackjack Apprenticeship which trains, equips, and provides a community for card counters. During the episode, Colin talks about the ability to count cards and beat the casinos for profits. He reveals what most gamblers fail to realize – Blackjack is a game that can be beaten. Find out why there is no gamble if you think differently, work smarter, and use the odds to your advantage. 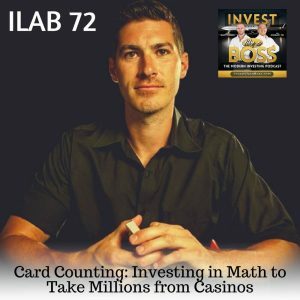 Listen to ILAB 72 on iTunes here or subscribe on your favorite podcast app. 16:09 – Is card counting illegal? 19:45 – Do you max out the ability in card counting? 23:24 – Where do his network play? 25:34 – How long does it take to master card counting? 29:29 – How much capital do you need? 35:46 – What they do on Blackjack Apprenticeship?